We were just on the Live Your List Costa Rica adventure (part of the entrepreneurial mini series featuring us as the marketing experts along with Brian Tracy) we were constantly asked these questions and more like them. And the usual answer began with “It Depends” because it varies by company. But there are a lot of tools which are universal to most businesses. So what are the basic marketing tools? In the last three blogs and the one after this, I am going to take a look at The Basic 15, three at a time. If you want all 15, click on the video and watch all of them! You can also check out this topic on my radio show, The Marketing Checklist that has all of them as well. Let’s get back to it with numbers 10 to 12. They’re targeted. A newspaper or radio ad goes out to a wide audience, only some of whom might be in the market for what you’re selling. With promotional products, you control the distribution, resulting in a more powerful marketing effort and better return on investment. They’re customizable. There are thousands of promotional products available in a wide range of price points to meet any budget, theme and marketing objective. Plus, you get to choose the message, the audience, the colors, and much more. People keep them. Research shows that six in 10 consumers keep promo items for up to two years. More than half (53%) say they use a promotional item at least once a week or more. In comparison, an ad or billboard gets glanced at once or twice, if you’re lucky. They’re versatile. There are so many ways you can use promotional products, including as thank-you gifts, customer loyalty items, employee appreciation gifts, trade show or conference giveaways, sales meeting leave-behinds, safety program and sales incentives, traffic drivers, and in direct mail, to name just a few! They’re useful. If you choose a promotional item recipients will value, they will use — and appreciate it — frequently. And this results in continued exposure for your brand. They’re memorable. In one study, 88% of those surveyed could remember the advertiser on a promotional product they’d received in the past 12 months. In comparison, 71% recalled advertisers in a newspaper or magazine they had read a week before. In another survey, respondents were asked to think about a promo item they had received in the past two years. When asked to recall the product, advertiser and message, 76.2% could remember all three. They create goodwill. Customers, prospects and employees all appreciate receiving a gift. A useful or fun promo item creates a positive impression of your company and lasting goodwill. They can boost sales. Half of consumers in a study had done business with the advertiser before receiving a promo product. After receiving the product, 85% did business with the advertiser. They Build Brand Awareness – Whether the recipient keeps the item or passes it along to someone else, every time the product is used, your company name is seen. And this will lead recipients to think of you the next time they need the products or services you provide. If you give away a wearable item like a hat, t-shirt or hoodie, recipients will become walking billboards ever time they wear it. People love them and want them! Yes, most people would rather die than speak in public. I understand that. I feel your sweaty palms. So let’s break it down to the very smallest basic. Have you ever made a one-on-one presentation to a client? You spoke in public. Has that client ever brought their assistant, or their 4-person department to sit in on the meeting? You spoke in public again. Ever raise your hand in your college history class and give a 20-second answer to what the professor had asked? You did it then, too. You spoke on a topic you knew. And that is the key. 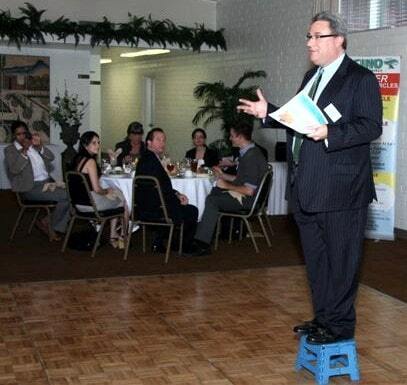 When I say that you should speaking in public I am not saying to jump ahead to dozens, or 100s or thousands of people. Even if you are not nervous. You are just sharing information. Run your own seminar. We do that all the time. We still do a Sedona Marketing – LOS ANGELES EDITION twice a year in Los Angeles. We run 2 1/2 days, but one day works, too. Speak on a panel. This is fun. You are done in an hour or so and get to share sound bites. Most of the time it works to your advantage. It always helps to know the other people on the panel. Some time, when you see me in person, ask me about the time I wanted to rip the ‘smug’ off another panel member. MC an event. This is the best. Your job is to keep the event moving and get done on time. You get to gently seed the audience with what you do, but are not responsible for all the content. Teach your subject. From a one hour “lunch and learn” at your local chamber to being called professor at your local college, you are helping those who want more information about your topic gain more insight. Keynote Event. This is when they pay you to speak. 30 minutes to a couple hours. OR they hire you to lead the event for the day. Build up to this one and you will be well on your way to using public speaking as an incredible marketing tool. I am going to be brief on this one. Find a need in your community and get involved. Sharyn and I talk non-stop about International Child Advocacy Network, www.YesICan.org but there are many other organizations and groups that need attention. Kids, Animals, water, diseases, parks, seniors… find something that speaks to you and get and stay involved. First – Our communities support us. We cannot own a business without the support of the community. Yes, it is our initiative that gets our business moving. Our hard work and long hours. But a restaurant without diners is… closed. Whether it is word of mouth or massive advertising buys, I feel that as an entrepreneur, it is our job to get and stay involved. Second – When you are involved with a non-profit, you meet people. You immediately have something in common. You become friends. And people like doing business and referring business to friends. So make it organic and get and stay involved. Would you like help with some of these basic marketing tools? Call me at 800-705-4265 and let’s get you started down the right marketing path. You can check out more of my marketing blogs at www.SedonaMarketingRetreats.com.